Well, had another 10cm snow fall yesterday, so, since it was on the sticky side, decided to play with the kids, and make a snow man. When a snow man is tired of winter, it means winter has really over stretched it's stay. Your neighbor has a nice lookin' yellow house. Yeah man, it is downright discouraging. Haven't cried yet but one more snowfall and I cant say for sure. Sposedsta drop below 20 here tonight. Full sympathy for our north of the border brethren. Hang in there Jack; it's gotta end sometime. Last edited by RobertLever; 03-24-2014 at 08:12 PM. So officially screaming at the sky and waving your fist does NOT work. Nor does removing your snow tires each time you hope for no more snow. (this might make it worse). This winter did force me to get a new touring jacket (Fieldsheer hydro tour; already had one). I can ride 75mph in 7*F and not be at all cold. One glimmer of hope; MOTOGP yesterday. What a race! If i'm lucky, I will be riding by May! This past weekend it was a balmy -26C, and the forecast isn't looking too promising either, we wont see any above freezing temps until the first couple weeks of April. 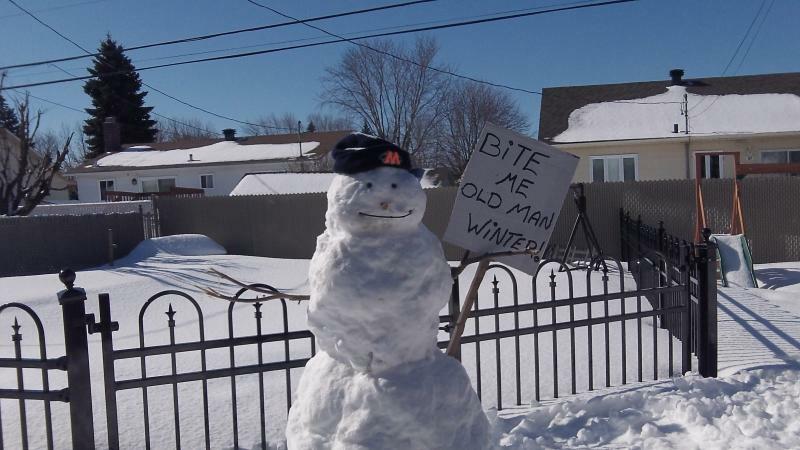 Then, once it finally warms up, just have to get rid of the massive amounts of snow everywhere...I'd love to give Mother Nature a big slap right about now, just after I kick old man winter square in the nuts. Yep this is a Never Ending Winter, but April looks to turn it around of us in the NYC / Philly metro areas. Hopefully this Nor'Easter will stay to the East, but Boston & Cape Cod could get a big spanking. Not only has it been uncomfortable but the economic impact is massive. We should be spreading a thousand bucks worth of lawn chems a day - nada - everything is still dormant. I saw a news article weeks ago that claimed that this winter has cost Americans over 50 billion dollars. Now that's a lot of money and there's a lot of us but that's really how bad it's been. Our last cold front thru Central Texas was another insult but the low in Duluth was 3F. In years past we would be out on the abandoned rr grades in Northern Minn on our dirt bikes. Those grades are still under several feet of snow this year. Quick Reply: Never ending winter !